Orange suits you, Jack. Nice grip too. It seemed fitting that Michael Ignatieff spoke before Jack Layton on Sunday. Both national leaders attended Khalsa Day celebrations in Queen’s Park for Toronto’s Sikh community and it was clear from the ovations who was the star and who was the opening act. The applause for Ignatieff was congenial. For Layton, the cheering was loud and, midway through his speech, chants of “NDP! NDP!” rose from the front of the crowd. The scene was a microcosm of what’s happening in the national polls, where Layton’s party is surging hard and running almost neck and neck with Ignatieff’s Liberals, who are collapsing this April like the Vancouver Canucks. Layton seemed ever-confident and fed off the energy of a crowd familiar with him and his hits: social spending, family-first initiatives, focus on healthcare. “I see a lot of orange here,” he said, noting his party’s colours matched the headwear of many of the 50,000 who came to the park in what’s become the third-largest annual parade in Toronto. Layton was in his element; Ignatieff came across as well meaning and gracious but appeared more like a guest than a friend. If his campaign does indeed fail, its downfall will be that: He just hasn’t been involved in the community for as long or viscerally as Layton and other politicians. Since writing that I won’t vote on May 2, I’ve received responses — online and off — from conscientious people encouraging me to change my mind. Some, though, agree and also vow to remain on the sidelines. 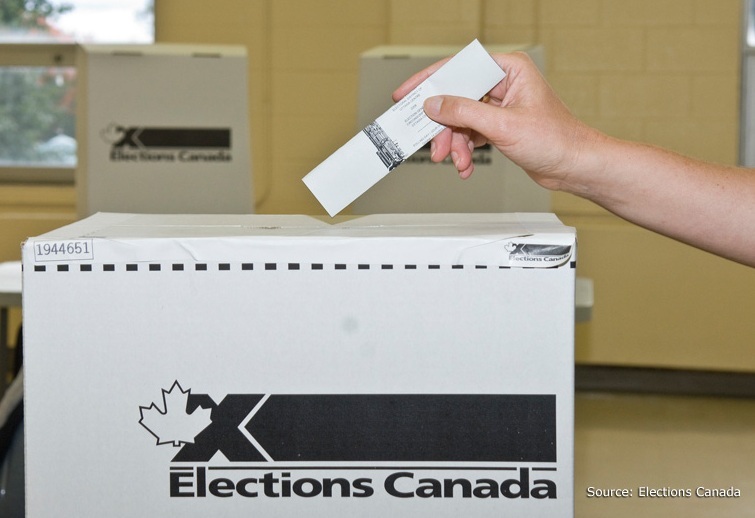 For all of those candidates, reporters, Elections Canada officials and dutybound citizens desperately searching for ways to get us interested in this election, here are five things that might shift our position and lead us to the polls. How many people will not fill a ballot box? That's the question. 1. Guarantee my Groupon. You can keep the half off the bowling in north Oshawa, but I’ve had it with missing out on two-for-one dinners at Loire and Pearl. Have those deals ready for me at the polling station, and I’m there. Might even vote twice if you did that. 2. Dunk tank. Cast a ballot, get the chance to dunk Justin Bieber. You want to get the youth vote out? There’s your answer. 4. Promise to lay off the guilt. Yeah, people in Tahrir Square died for democracy. Yeah, kids in other parts of Africa would die (and have died) for rights we take for granted. But let’s talk about our reality, which is our national parties that don’t inspire us and our leaders who want our vote simply to stick it to their opponent. Oh, and by the way, when we did turn out in decent numbers in the ’80s and ’90s, we ended up with two of the most corrupt Canadian governments in history (Mulroney’s Conservatives and Chretiens’ Liberals). So voting may not be the answer to our political troubles. Not voting? En masse? Wonder what kind of wake-up call that might send. 5. Pay me. In Australia, voting is compulsory and you’re fined $85 if you don’t show up to the polls. I advocate for a similar approach, but rather than a fine, why not cut the salaries of Members of Parliament by 10 percent each time there’s an election and dole that money out to people who vote? That would drop each MP’s salary from $157,738 (yeah, if you didn’t know, that’s how much they make and they get $25,500 in annual expenses on top of that and not one of them is bringing it up during the campaign, but we’re supposed to rush to the polls for these people?) down to $141,964.10. 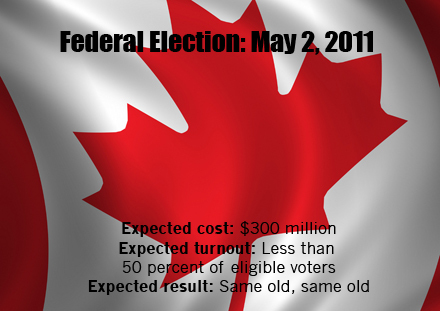 Take the $15,773.80 you cut, multiple it by 308 (number of seats in Parliament) and you have $4,858,330.40 to dole out. 1. The business community wants stability. It’s a huge reason Canada’s banking system has earned high praise internationally and attracted currency buyers, sending the loonie to record levels and making all of us richer. Increasing the corporate tax rate from 15 percent (what the Conservatives have set it to fall to in 2012) to the NDP-proposed 19.5 percent would be a shock to the system. The world economy is still in precarious condition, as Portugal’s debt woes show, and no one can predict what the ramifications will be from all the other delicate situations in the world (Japan’s recovery, Arab world unrest, fluctuating oil prices). So while the left-leaning Canadian Centre for Policy Alternatives can come out with timely reports declaring corporate tax cuts are poor for job creation and capital investment spending, it hasn’t published a paper saying the business world would take a spike in the corporate tax rate in stride. 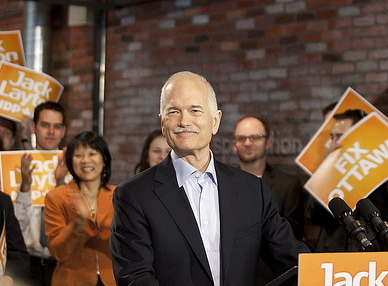 Jack Layton is taking the public for fools when he tells us he’ll keep corporate taxes here below the U.S. rate, which is 26 percent (although there are all kinds of ways around paying that much). Of course our rate is never going to increase to that level in this decade, and competing with the U.S. rate isn’t the point. Low corporate taxes, combined with a stable economy, will draw more corporations to Canada and retain those that are here. If the Conservatives or Liberals are smart (wishful thinking, I know), they’ll incrementally increase the corporate tax rate once the global economy is healthy. The goal should be to lure lots of big businesses here and then slowly turn up the heat to get as much as we can out of them before they flee to Zug, Switzerland. 2. Layton’s a great attack dog. What would happen if he actually got that bone? Truth is, there’s reason to doubt his ability to lead the nation. Think Barack Obama, without the massive groundswell of support, global goodwill, happenin’ dance moves and cute kids. 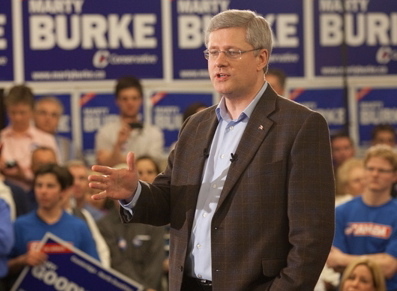 Best moment: He did what he had to do: Win the one-on-one debate with Stephen Harper. Up until that point, Harper’s calm and collected demeanour made him appear in command while Ignatieff and the other leaders seemed to lack authority and the way to wear it. Ignatieff stripped him down, beginning with: “You haven’t earned a majority. Majorities are things you earn when you earn the trust of the Canadian people.” In that succinct moment, Ignatieff encapsulated Harper’s plight and, perhaps, his legacy. Minutes later, he hammered at Harper’s imperiousness when he told the Conservative leader his contention that the Canadian people were sick of Parliament’s “bickering” was dead wrong. “This isn’t bickering, Mr. Harper this is democracy,” and added that Parliament wasn’t “some pesky little interference that gets in the way of your power.” From then on, Ignatieff pulled himself level with Harper in terms of holding a commanding presence on stage. 1. He lies. He lies so often you wonder if it’s a reflex. He lies with such audacity there’s not need to cite any examples to convince you it’s a fact. You can just be directed to one of the sites that have catalogued his fibs, whoppers, exaggerations, misstatements and inventions. While all politicians are prone to lying, Stephen Harper’s serial dishonesty is the one thing that should make you wary of removing the training license that is a minority government and giving him the keys to the dominion. 2. Kudos to the Aboriginal Peoples Television Network for breaking the Bruce Carson scandal. 1. 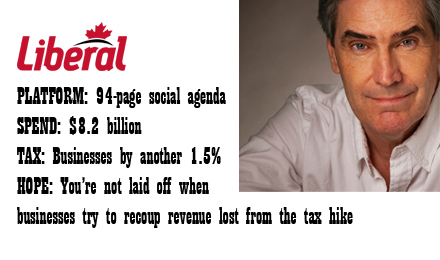 For Michael Ignatieff, the title of Prime Minister of Canada pads his curriculum vitae. He’s a brilliant man with a long list of professional and academic accomplishments. Feats of public service? Not so much. Even he agrees.